*Kitchen TIP* Wilted Stink Celery? No Thanks! Keep your Celery Fresh for Week! Don’t you hate it when you open the vegetable crisper in your refrigerator only to find, limp, faded and sad looking celery? Suddenly adding celery to your salad doesn’t sound so appealing! Keeping your celery super fresh and crispy for weeks is as easy as wrapping it up in tin foil. Who knew right? I have been doing this for months and I must say that it truly is the greatest tip I have ever found. Who wants to pay money for something that doesn’t last long enough to use it all? Do NOT wash the celery, simply remove the plastic wrapping your celery comes in, then proceed to take a generous piece of tin foil and wrap the celery up in it tightly. 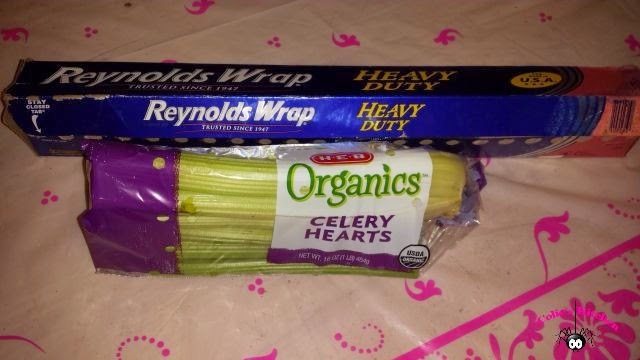 Each time you use the celery re-wrap it back in the same tin foil. Your celery will last for many more weeks than it conventionally has, and it will look just as great and remain as crisp. You will want to do this as soon as you get home from the grocery store to help slow down the aging process as soon as possible. This is quick, easy, and painless what more could you ask for? Give it a try! I would love to hear how it works for you!